We always love the latest from Oots! We’ve featured its kids’ crockery and groovy lunchbox before, and now Oots has launched some fabulous sleeved bibs called Bbibs. My four-year-old eats impeccably, but his brother is a disaster at mealtimes, despite our best efforts in training him to be otherwise. He still needs lots of coverage when eating, and sleeved bibs are an absolute must as he playfully explores his food, blissfully too young yet for manners. Bbibs are just the ticket during these early years when a big mess is inevitable. 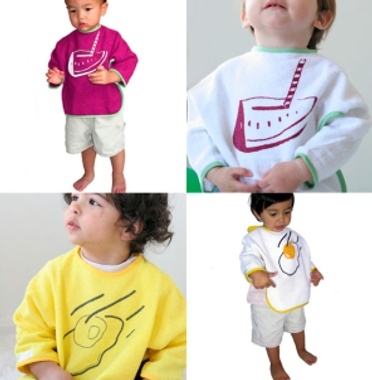 Available in eight fresh boy, girl and unisex designs, there are three sizes to suit babies from 6-12 months, 12-24 months, and 24 months and up. Oots’ Bbibs are US$18.95 each plus post.